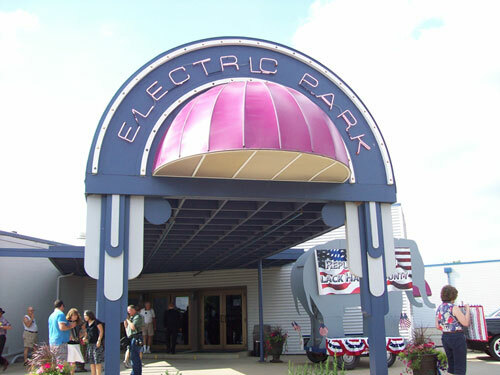 I’m sitting in a booth at the Electric Park Ballroom in Waterloo, listening to Elvis sing “A Little Less Convesation” over the sound system along with the murmur of people entering the hall for a glimpse of Michele Bachmann, the Minnesota congresswoman who’s running for president. George and Janice Christian are sitting about four booths to the east of me. Janice went to school with Bachmann’s mother and knew the Bachmann family when they lived in the area. The Christians saw Bachmann this morning at the First Lutheran Church in Waterloo. The couple doesn’t remember Michele as a child, but they’ve followed her political career lately. “We’ve never been to anything like this before, so we just thought we’d come out and see what it was,” Janice said. The two are not regular Caucus-goers, but they may attend in 2012. The place is filling up fast. Gary and Karen DeVries of Parkersburg have no connection to the Bachmann family. They arrived early, securing chairs that are about 20 yards from the microphone Bachmann will use to speak to the crowd. “We’re here to see what she says and we’ve been watching her on television,” Karen DeVries says. “I go to every tent in the circus,” Laudner says of his presence here. “Huck at the Surf, I had to go see that.” Former Arkansas Governor Mike Huckabee played a gig at historic Surf Ballroom in Clear Lake in October of 2007. I don’t believe Bachmann will be playing a musical instrument. There’s a riser in the middle of the ballroom floor. After an announcement from a Black Hawk County Republican, urging the crowd to stand on the hardwood if they want a glimpse of the candidate, people have started streaming into the center of the venue — rushing the stage, but in an orderly manner. It’s less than half an hour ’til show time. I’ll be back with another post soon.